Watch this space for more Thai food now that summer is coming. Tropical fruit gets all the love, but vegetables like eggplants, peppers, and squash are unique products of hot temperatures as well, and with summer comes the opportunity to cook like we live someplace warmer. Like Thailand. My sweet tooth has always liked the idea of eating dessert first, and we’re starting our summer Thai series with it here. I have to admit that we cook less Thai food now that Little Uncle makes it so well and so close by, but the flip side of that coin is that it was one of their desserts that reminded me to dig out this recipe for black sticky rice pudding. (The dessert in question was kabocha squash simmered in sweet coconut milk; watch for it on the menu!) It’s a great dessert to make for a party because it’s so simple yet visually impressive, and also because you can make it in advance and serve it cold or gently reheated. Little Uncle’s simmered kabocha was excellent stirred into this rice pudding, but if you don’t have any handy you can just serve it plain, as I usually do, or with mango slices stirred in or on the side. Of course you can also make this dessert with white sticky rice in place of the black, although, as you’d expect, the resulting color is a bit more pedestrian. Try to remember to save a swirl of the thick coconut cream from the top of the can to garnish the dish. 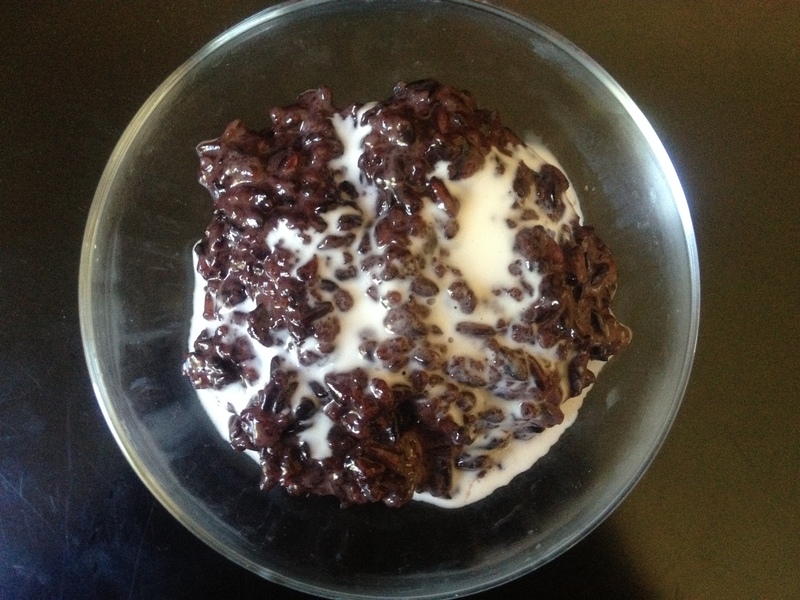 Black Sticky Rice Pudding with Coconut Milk: Boil 1 ½ c. black sticky rice (or white, if you must) with 3 c. water and a good pinch of salt. Lower heat and simmer 30 minutes, until rice is cooked, stirring occasionally. Add 1 c. coconut milk (not light, please) and ¼ c. sugar (or more, to taste) and simmer 5 mins. Garnish with more coconut milk. Serve hot or cold, with or without mango slices stirred in or on the side. This recipe comes from a compilation of recipes we got from the cooking school we attended in Chiang Mai, Thailand. The original recipe can now be found online here, and here’s a link to the school’s fancy new website. We loved the week-long class we took here, and I highly recommend it next time you’re kicking around Thailand! This entry was posted in Asian Flavors, Desserts, Easily Multiplies to Feed a Crowd, Feeding Kids, Food, Recipes, Vegan or Would-Be-Just-As-Good-Vegan and tagged black rice, coconut milk, cooking classes, dessert, eat dessert first, Thai recipes, Thailand, vegan on June 28, 2012 by emmycooks. I have black rice and using it for rice pudding sounds good. It probably doesn’t taste much different from a brown rice pudding with coconut milk, but it certainly looks more dramatic! Yum! So excited for Thai recipes! This looks amazing…I’ll be staying tuned Emmy! Me too! I have been digging through my recipes and looking forward to a visit to my favorite Thai grocery store. That is too ridiculously easy! Can’t wait to try it! It really is easy–I like a one-pot dessert that isn’t too unhealthy and can feed a crowd! This sounds really good. I’m off to find black sticky rice now! Enjoy! And I bet it would work with any short-grain black or even red rice. My co-op has some fun ones in the bulk section. Love this! Thai is one of my favorite cuisines – I can’t wait to see what you post! Sitting in my childhood bedroom, where it’s hot, hot, hot, but happily so. You’re so right, the hints of summer make thai flavors that much more appealing. I haven’t tried to make sticky rice before, but perhaps it’s time. It was great. I highly recommend both Thailand and the cooking school! I want to eat my way through Thailand, Vietnam, Singapore . . . wait . . . there is actually not any country that I wouldn’t want to eat my way through except for Papau New Guinea. I will pass on Papua New Guinea. Something exotic to try! The usual (white rice with milk) seems pretty pedestrian by comparison. Cooking school in Thailand? What an experience that must have been! I’m a total sucker when it comes to coconut milk. Can’t wait to give this one a try.